Hops can be categorized by the role they provide in the brewing process: bittering, aroma, and dual purpose. 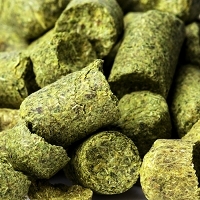 Bittering hops are normally high in alpha acids and low in essential oil content. In contrast, aroma hops contain high levels of various essential oils while having a lower percentage of alpha acids. Finally, dual purpose hops are found to have a more balanced chemical distribution between alpha acids and essential oils.